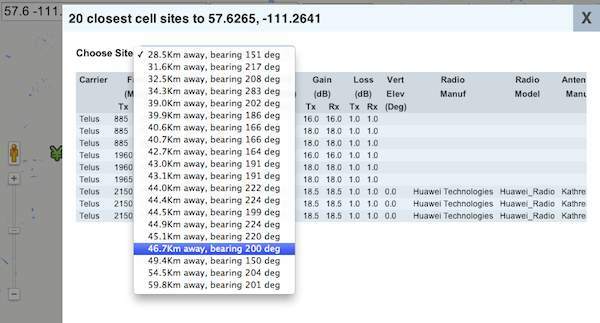 The Antenna tab (see left example below) lists a cellular site's antenna, arranged by carrier, then modulation and then frequency. This arrangement requires that you inspect the entire list to find what you're looking for, a time consuming and error-prone task, especially for larger sites. Wouldn't it be helpful if what you are looking for could be in one location? Essentially, antenna that match the filter now appear at the top of the list, separated from other antenna by a thin horizontal line. Also, matching values are colored red. This new feature makes it much easier for you to find what you're looking for. 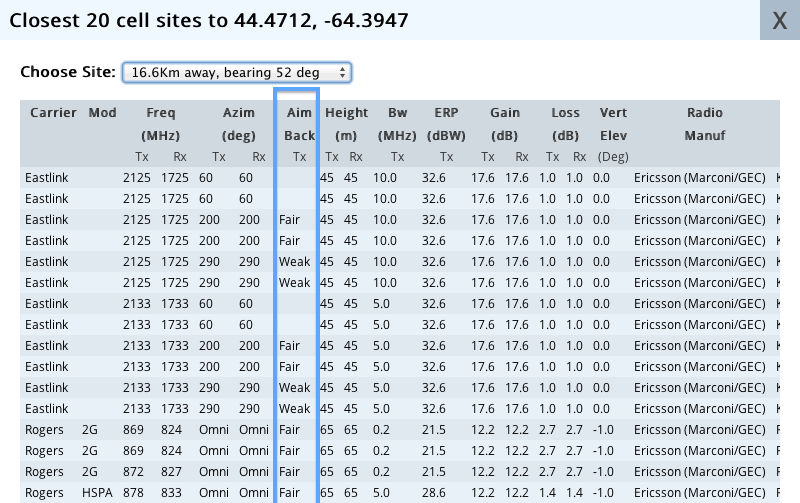 The filter list, partially shown below, now includes five Modulation and 26 Carrier + Modulation filters, companions to the Antenna Modulation column we added a few weeks ago. Does your equipment work only with CDMA? Select CDMA. 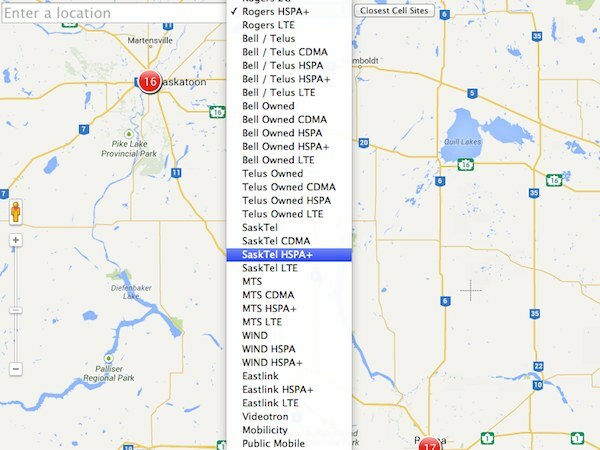 Do you need that — but only for SaskTel? Select SaskTel CDMA. There is a filter for each combination of carrier and modulation technology (2G / EDGE, CDMA, HSPA, HSPA+ and LTE). 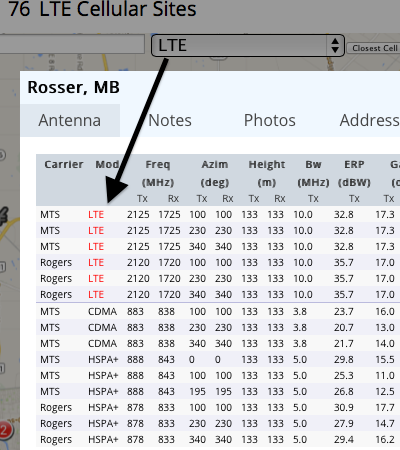 Carriers that use only one technology, like Mobilicity, which uses HSPA exclusively, instead have a Carrier filter. 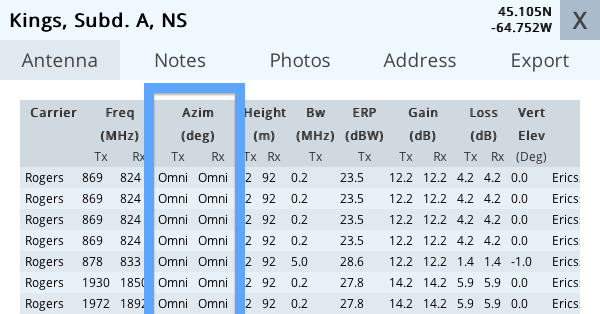 Antenna direction, as displayed under the Azim column below, has been available from Canada Cellular Services for some time. Today, we introduce Aim Back, a companion column that tells you how closely the transmitter (Tx) antenna aims back to your location. Aim Back is especially important when installing a directional booster antenna. LTE, HSPA and CDMA are more than just marketing buzzwords. 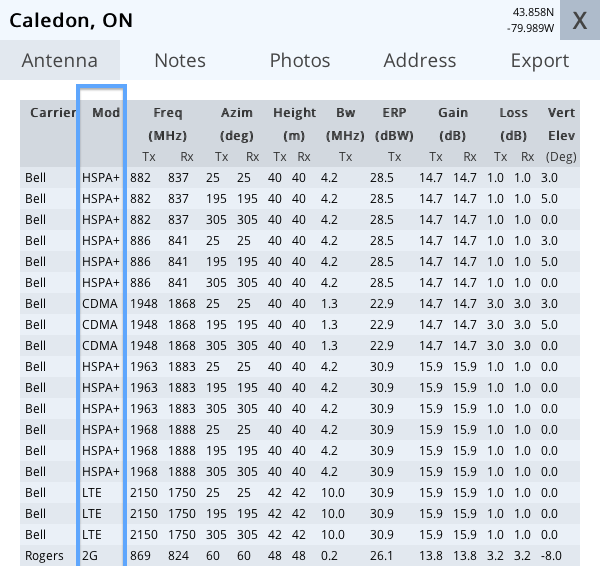 They are also modulation technologies, now displayed under the new Mod column of Canada Cellular Services. We currently support iDEN, 2G (EDGE), CDMA, HSPA, HSPA+ and LTE, for most carriers. Antenna direction, or Azimuth, has been a feature of Canada Cellular Services for some time. We now identify Omni-directional antenna, which broadcast and receive signals from any direction around the site. The expanded coverage of an omni-directional antenna comes at a cost — signal strength is diluted and will not propagate as far as with a uni-directional antenna. If you look closely at the center of the map you might see something new — crosshairs. It's a tiny addition to the map, but a huge benefit to subscribers who use our new Closest Sites feature. The crosshairs identify the point on the map from which distance and bearing are calculated for the closest sites. Our cellular database now includes Eastlink, a carrier from the Maritime provinces. They're off to a fast start, with 21 sites operating in PEI, 6 in New Brunswick (near the Nova Scotia border) and 140 across mainland Nova Scotia. They enter the market with roughly as many antenna as Public Mobile and Mobilicity, two well-established carriers, and half as many as Wind, which entered the market with much fanfare almost four years ago. To find the distance and bearing to the closest sites, first Sign In. Then, click the Closest Sites button. 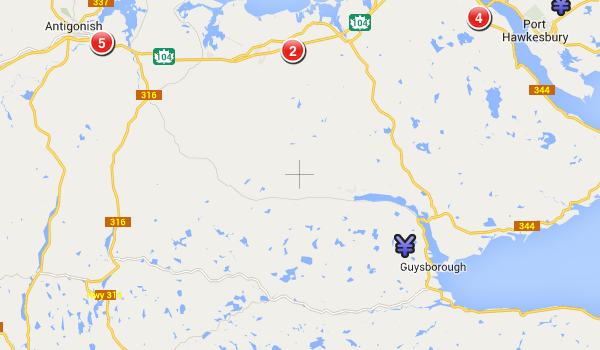 The search examines all sites up to 100km away, with the 20 closest listed in the pop-up-window. Select a site from the drop-down control to see its technical details. antenna direction: uplink and downlink should face each other. The Placename picker, located in the top-left corner of the map, lets you easily position the map over a city or other named place. We recently expanded its functionality for subscribers, to allow for the direct input of latitude / longitude, which should come in handy for those who work in remote, unnamed places. For example, to position the map over Calgary, you can now type 51.03 -114.1 and then press the Enter or Return key on your keyboard. Coordinates can be entered with or without a comma: latitude, longitude or latitude longitude. You can also enter the longitude as a positive number (eg. 51.03 114.1) and it will be interpreted appropriately. We recently added Statistics Canada Census data to our extensive suite of cellular reporting tools. Changing usage patterns supported by gigabyte smartphone data plans will require carriers to deploy even more antenna and thus more cellular sites. As a result, we expect these numbers will climb uniformly across all cities, over the next few years. But why does Montreal have 150% more sites per person than Winnipeg? contact us with your ideas and answers. Earlier this week, the Toronto Star ran a story titled Cellphone towers often unwelcome neighbours. This story ran on the front-page in the Sunday, June 16th edition of the paper, and appeared online the following day. 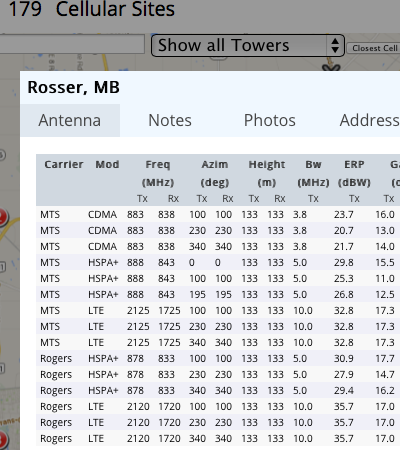 Its author, Noor Javed, contacted us a few weeks ago, for cellular site and antenna analytics across the GTA. We also helped their geomatics department to produce a large, detailed 1/2 page map, which appeared in the print edition. 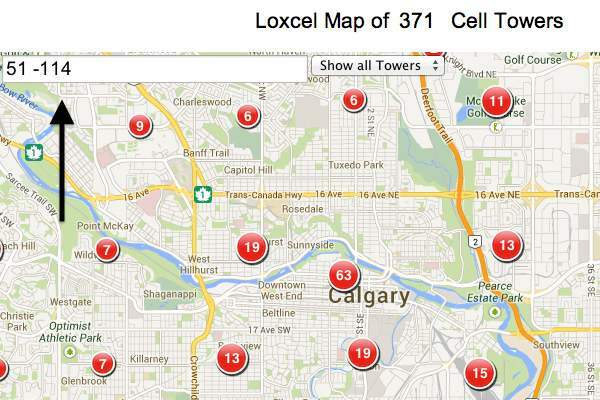 We have archived cellular site databases back to 2004. If you need to analyze cellular site or antenna distribution, now or in the past, from the municipality up to the entire country, please get in touch for more information. There is a strong correlation between population and carrier presence, across all 13 provinces and territories. 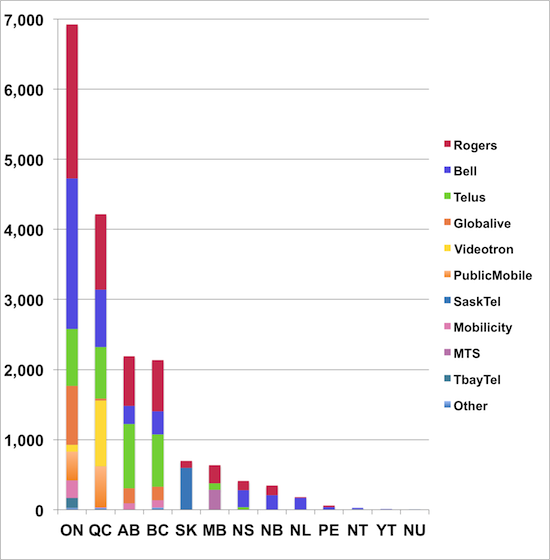 As this graph shows, the provinces with the largest carrier presence are also the most populous: Ontario (ON) with 6,920, followed by Quebec (QC) with 4,218, Alberta (AB) with 2,189 and British Columbia (BC) with 2,134. And, the three least populous territories have the smallest carrier presence: Northwest Territories (NT) with 27, Yukon (YT) with 12 and Nunavut (NU) with 4. Provinces with the rainbow colored vertical bars suggest strong competition for subscribers. But, do good deals lie at the end of these rainbows? 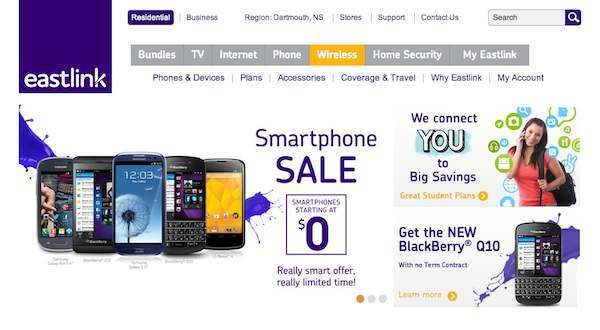 Is that 200 minute / 500 megabyte plan cheaper in Ontario, with its 10+ carriers, than in New Brunswick, with only two? Contact us with your observations. Forgot your Loxcel account password? We will then send you a validation email. Open it and click on the link, to display a webpage that asks for your new password. 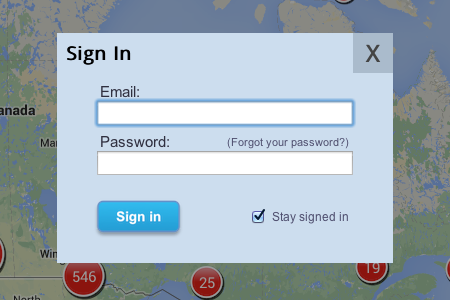 Supply a new password and you're ready to Sign in and collaborate. Last week, we rolled out Cellular Site Notes & Photos that let you write and preserve notes and photos about a specific cellular site to share within your company. Notes and photos members are visible only to you and others within your company. 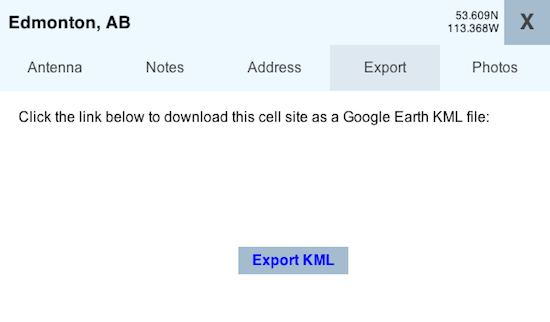 Team members can now export a cell site to a Google Earth KML file. 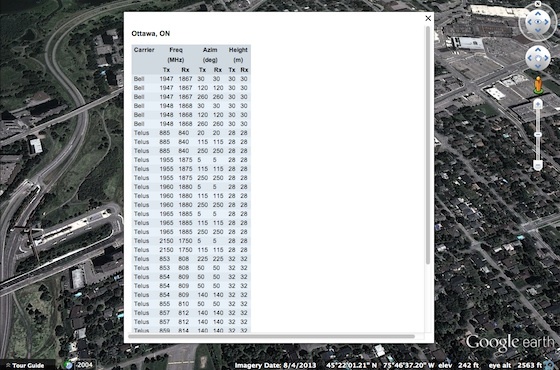 When you load the KML file into Google Earth, you'll see antenna details such as Carrier, Frequency (Transmit and Receive radios), Antenna Azimuth (Transmit and Receive) and Antenna Height (Transmit and Receive). 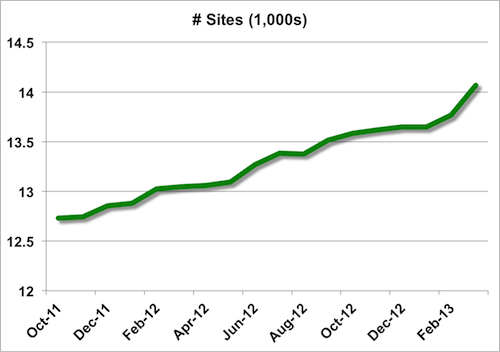 Last summer, we presented two graphs that depicted carrier antenna and site growth. We thought it was time to update those graphs. 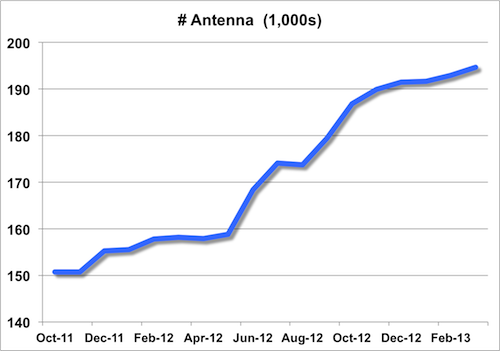 This graph charts all carrier antenna: Cellular, iDEN and Microwave backhaul. 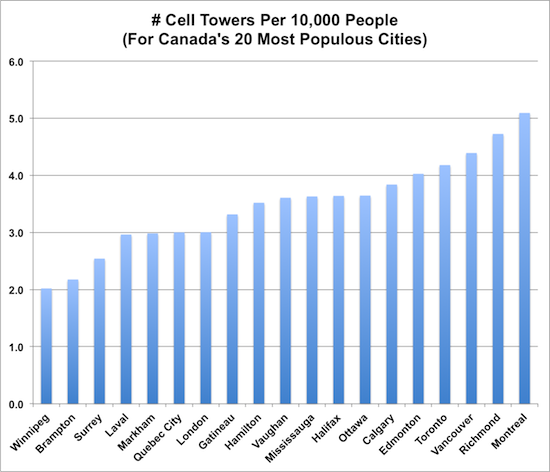 And, this graph tracks the growth of cellular site that provide cellular and/or iDEN service to Canada's 26.5 million wireless subscribers. Our site counts closely track the official figures published by the Canadian Wireless Telecommunications Association. We have packaged information about these sites and antenna into a variety of reports. Please Contact us for more information.